Those were the days when we went round the town collecting donations for the National Defence Fund. One vividly remembers the film ‘Haqueeqat’ so movingly, so realistically directed by Chetan Anand. Picturisation of our brave soldiers fighting the Chinese in inhospitable terrain, dying helplessly on account of severe cold, shortage of arms, ammunition and food left an indelible impact on our minds.Yes, we joined a college just then. Did not know much about ideological warfare or commercialization of politics. Today ‘criminalization’ is the key word. But we were familiar with the slogan ‘Hindi-Chini-bhai, bhai’ and the so called glorified programme /tenet of Panchsheel. We were moved when Lata Mangeshkar sang ‘Aye Mere Watan ke logon’ set to a touching tune by C. Ramachandra. Also remember how Pandit ji complemented the melody queen of India : ‘Aap ne hamein khoob rulayein.’ Flocking around the community radio in public parks [transistor radios were rare. Radio was a luxury then]we used to listen to news of the war forced on India on account of the aggression committed by China shameleslly on the territory of a so called ‘bhai’. Tezpur, Bomdilla, Tawang became familiar places, though I could visit them only in 2009. 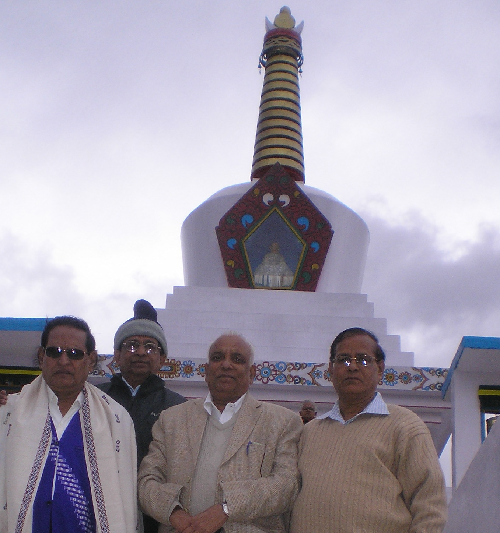 I attended a National Seminar in Tezpur University in April 2009 and proceeded to Tawang with friends by road. The scenic beauty of the place makes one feel that paradise is nowhere, but very much here itself. The towering trees on rising mountains on one side and deep gorges on the other make it an unforgettable experience. By the time we reached Bomdilla , it was noon and we had lunch in a restaurant and enjoyed piping hot tea, in increasingly chill environment. Met some friends working in a college there and pushed ahead. By two o’clock ‘mausam kharab ho raha hai’ said the friendly taxi driver. We could understand what he meant a few minutes later as rain started pounding. 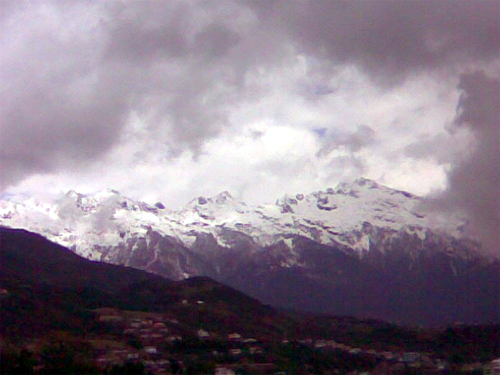 A little while later we noticed snow clad peaks all around. To our pleasant surprise and bewilderment we travelled on snow covered hilly road for nearly 32 kilo metres. My earlier visits to Shimla, Kullu, Manali, Rohtang pass, Darjeeling and other places simply paled into insignificance as we were wonderstruck with the ever extending snow fall and enveloping darkness that looked so formidable while we were travelling along Se La pass. It was enjoyable and frightening at the same time. The experienced cab driver reached us safely to the hotel he knew well at 9.30 P.M. Hopping from the cab into the warmth of the hotel room itself was an experience. We just could not walk a couple of feet without the support of the cab driver and the hotel staff. Coming from Andhra Pradesh and Maharashtra we took quite some time to acclimatize ourselves. Next morning soon after breakfast we went round Tawang town looking at the glistening snow clad peaks of Himalayas at a distance. While the whole country was almost experiencing sweltering heat of summer, here we were shivering due to the extreme chill conditions in Arunachal Pradesh, a little away from China border. We dared not imagine how it would be in winter there. Certainly, beyond our limited exposure to harsh, cruel winter evenings and nights away from home. Our visit to the famous Buddhist monastery was a rewarding experience. War memorial there was a testimony to the sad and cruel events of a war fought half a century ago. We were in tears looking at the photos of the martyrs who sacrificed their lives while protecting our motherland and her people. We also sadly recollected how unprepared was India then and how callous were the political bosses of the times who preferred to dwell in their own world of illusions. Most ill-equipped men in uniform became fodder for the modern weaponry of the aggressor. Movement of our army became hazardous as there were limited means of communications, while the enemy was prepared excellently with well laid roads , advanced means of communications and good landing facilities for their air craft. Virtually our men, less in number, defending our sovereignty with weapons used in second world war, with a support system not adequately operational simply died helplessly, facing the brutal forces marching ruthlessly in thousands. Spine chilling experience even to recollect! It was a mindless, political hara-kiri, to say the least. Hapless soldiers and their officers became the sacrificial lambs. But, it is an eloquent validation of the integrity, patriotism and fighting spirit of our security forces. They have always served the nation and the people with unswerving devotion. 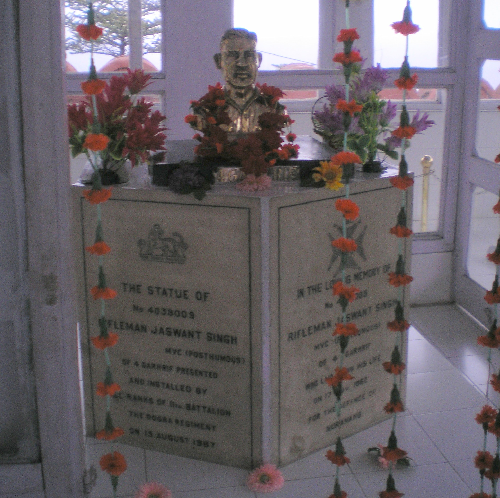 On our journey back to Tezpur we halted at the memorial for Jaswant Singh the rifleman who fought till his last breath at Se La pass, trying to stop the rushing, well equipped Chinese forces. We stood in silence and paid homage with tears streaming down our cheeks. With blurred vision we read the tribute inscribed on a plaque and were speechless for quite some time. Looking around one could see the hostile terrain, freezing cold, chill Himalayan winds just slicing across. 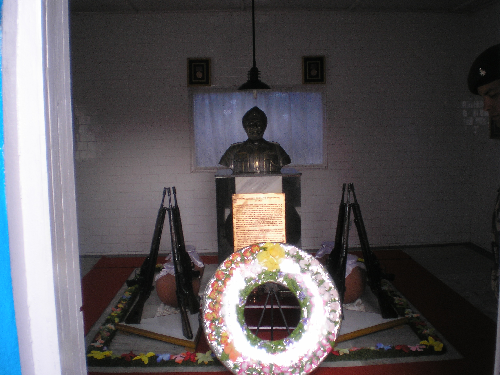 That was in April 2009.We shuddered to visualize how it was fifty years ago, when the brave soldier became a martyr. 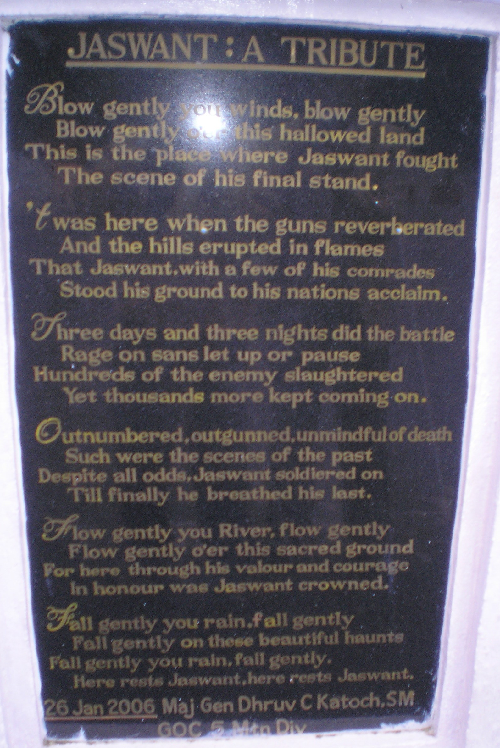 Jaswant Singh Rawat was awarded the Param Vir Chakra posthumously. The warmth of piping hot tea served so affectionately by the men at the post guarding the place revived our spirits. I felt that it is their way of reminding the countrymen that they serve the nation where ever they are posted irrespective of terrain, time or climate. Towering snow clad ridges on one side and deep gorges on the other side of the road made it all the more hazardous to drive in the snow fall that started to intensify. Slowly the roads were all covered with thick snow, as the automobile raced down the mountains. Snow covered white trees around , frozen pools of water and biting chill wind made it a unique journey. We learnt that the valiant soldier Jaswant Singh fought till his last breath, ably assisted by two tribal girls of the area, with one arm operating the rifle. He was grievously wounded by then. The girls were filling the magazines and handing them over to him. He could stall the onward march of the aggressors for pretty long time, till a fatal bullet claimed him. The remorseless Chinese army hanged his dead body to vent its frustration and ill temper. The two tribal girls are said to have committed suicide by plunging into the deep gorges to save their honour. At once I remembered the scene in ‘Haqueequat’ where Priya Rajvansh, the heroine, is shown being tortured and defiled by the Chinese troops. I could relate well. Then, suddenly the moving lines from Lata ji’s song “Jo shahid hue hai unke, Zara yaad karo Khurbaani ”echoed in my ears. The road was invisible as streaming tears blurred my view. The Taxi driver informed us that no force can harm our county or the countrymen, as “the ‘atma’ of Jaswant Singh saab bhatakte rahegi idhar, is watan ke raksha ke liye.’ Even the men at the post feel secure in ‘his’ company there. For them he is still among us only. Just shows the spirit of camaraderie. Not spirit of ‘comrades’! None has forgotten the statement of a famous fellow traveler that their plan was ‘to strike from within.’ No politics, sir. Pure and unalloyed patriotism only saves this country as demonstrated by our security forces from time to time. We travelled 50 K.Ms in snow clad terrain during our return trip and rested for a while and enjoyed piping hot tea at a canteen manned by the army. The roads are maintained by the Border Security force. They were kind and helpful in providing guidance. Seeing the army posts at regular intervals, a sense of security had been instilled among those in the taxi.One has to necessarily visit places like these to appreciate the valour of our security forces and their inclination to sacrifice their life in defence of motherland. How noble is their selfless service and how willingly they are prepared to lay down their lives in defence of the country and countrymen! Certainly, on account of their presence and service every where we are able to sleep in comfort in our homes with our family members. Of course, we reached Tezpur in the early hours of the next day; having halted for a while in Bomdilla to share dinner prepared by a friend that night and enjoyed his hospitality. It was intensely cold and dark on account of power tripping . Yet, the genial friend living alone [a forced bachelor as he called himself] away from his family in Bhagalpur vivified the spirit of the people living in far flung places. Another friend from Cuttack who was working there and was also alone made arrangements for stay for the night, which was not to the liking of some of my friends in the taxi. So we had to drive through the night. Means of extending hospitality may be meagre, but the hearts of people living in far off places overflow with love for fellow human beings and they are sustained by a spirit of service. Probably the environment and company of defence forces might have strengthened their will to serve. Coalgates, scams, accusations, counter accusations, political maneuverings apart, security of the country and her sovereignty need to be accorded top priority .Let us salute the brave soldiers who sacrificed their lives and those that are ever prepared to serve the nation and her children! Three Cheers to the men in uniform! I am grateful to you Prof Bhushan sir, for your warm and affectionate words of encouragement.As rightly pointed out by you, we were all swayed by a spirit of patriotism and service to countrymen.Yes, many have joined the armed forces then.After graduation three year Engineering course was introduced mainly to recruit engineers in the defence services.Thanks for sharing your experiences and support extended.Regards. Those were the days! Days of Indian trust amd tragic mistrust and distrust. I remember the red carpet welcome to Chinese President and Premier and the whole nation resounded with Hindi-Chini Bhai Bhai. The golden principle of Panchsheel and peaceful co-existence went up in disgusting ruins and 50 years ago, I had joined college in Jalandhar and October saw the Indo-China military conflict. The college teachers and students everywhere were suddenly shocked and enthused with a more vigorous sense of patriotis preparing to join armed forces to sacrifice their lives for the defence of the recently liberated motherland. Chetan anand's Haqueekat inspired a new sense of this love and the wave of resentment,blamegame engulfed the whole nation. Then came the 1971 Indo-Pak conflict. I have been an active participant, sentimentally hurt but more enthusiastic, tried to be a commissioned officer twice. If this is narrated to politicians and people and students today, one feels a fool. This is the sorry mess! Thanks, dear Dr Mouli, for a refreshing and reinvigorating experience. Thanks Prof Asha ji for your appreciation of my modest piece of writing.Thanks for your suggestion.Boloji.com is a good e-zine.My association dates back to nearly a decade.Regards. I am beholden to you Prof Vishnu for a detailed feed back.It helps a lot,sir.Thanks a lot for your warm words of encouragement which sustain all my endeavours.Your homage through your lovely haiku is the icing on the cake.Your appreciation of the noble service and sacrifice of our security forces matters most,sir.Regards. 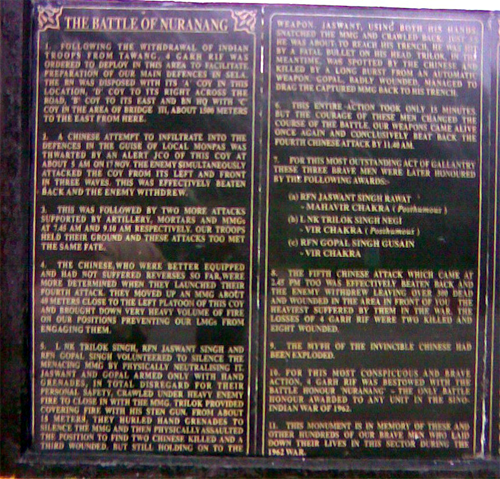 Prof. T. S. chandra Mouli here gives a detailed account of his visit to the land where the Sino-Indian battle (1962) was fought. While admiring the integrity and fighting spirit of the security forces who challenged and faced the daunting circumstances courageously Dr Mouli misses no chance to criticize the callousness of political bosses " who preferred to dwell in their own world of illusions." The memorial of Jaswant Singh makes a strong impression on him ( the description leaves an indelible impression on the reader's heart as well). A keen observer of facts, the author draws our attention to the fate of ill-equipped soldiers who became fodder for the sophisticated weaponry of the aggressor. ( well, in the recent past too, during Kargil war, our troops were still uninformed and ill-equipped. Sad indeed, we learn nothing from history). Sprinkled with poetic descriptions of the scenic surroundings the commemorative article is a heartfelt homage to those who laid their precious lives for a noble human cause. 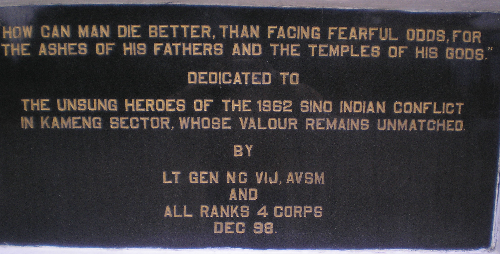 Whatever be the flaws in the political system, we must not forget the sacrifice of Indian soldiers. I salute their valour. I fully agree with view, Ramana Prasad ji.Thanks for your time and observation.Regards. You are very encouraging Prof Sunil sir.Thanks for your appreciation.I am afraid I do not deserve the compliments you showered on my write up.I salute you for your affection for me.Regards. I am not sure if others understand the sacrifices of the brave soldiers who has put up brave weather to counter the insurgency of chinese, "Hoke Majboor ise mujhko bulaayaa hogaa" .... the song sung by many wonderful singers has brought tears to the millions of people. I salute the soldiers who brought safety and security to the country with their tireless efforts and who have lost their lives fighting against chinese and pakistani. Extremely moving, lyrical, patriotic, nationalist master narrative from a globally-admired poet and literary critic, reminding an amnesic nation mired in corruption of the finer values that drive soldiers like Baba Jaswant Singh to reach a level of greatest self-sacrifice. Very motivating! Thanks for sharing this gentle wake-up call to collective conscience, dormant! Thank you very much,sir.Thanks for the photos too.Your presence made the trip all the more enjoyable.Regards. I was fortunate to accompany you for that North East trip.Your presentation brought back the fond memories of the trip.